Norman Rockwell, the famous illustrator who created hundreds of magazine covers in his lifetime, was hired to paint, like Michelangelo, but because his art was used to sell magazines, he is considered to be an illustrator. If his famous Saturday Evening Post cover of the Thanksgiving dinner, entitled Freedom from Want, hung in a posh New York City art gallery, then it would have been considered fine art. But collectors snubbed Rockwell as a sentimental illustrator. He wasn’t in the same league with the avant-garde artists of his time such as Willem de Kooning, Pollock, and Rothko. Yet ironically, Rockwell’s Saying Grace (1951) sold at Sotheby’s in 2013 for $46 million. Does that sort of price tag elevate Rockwell to the fine art status? I question this because I’m an artist who for many years has worked both as an illustrator and fine artist, and I often wonder what differentiates them. I’m currently working on three different types of art jobs. 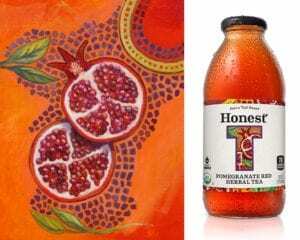 Firstly, I’m creating new labels for Coca-Cola’s healthy drink called Honest Tea, which will be out next year. (I painted six labels for them several years ago.) It’s clearly an illustration job as I was paid to paint an image to be mass-produced with the intention of selling a product. Secondly, I’m completing a public art commission for a hospital where I created designs, for a committee’s approval, then painted and sculpted these designs for pay. This falls under the Public Art tab of the fine art category. Lastly, I’m painting two privately commissioned sky-scape paintings for patrons who hired me to paint something particular for their homes. Although I was hired to design and paint these, just as Michelangelo was by the Pope, they’re not illustrations; they’re fine art. The interesting part for me is that the principles in making all of this art are the same for Honest Tea, Public Art, private commissions, or for myself. I have to consider the audience and their needs. I ask myself, what mood do I want to evoke and how best do I get there? I design the composition considering the elements of design and principles of art, such as the rule of thirds and odds, patterns, proportion, unity, values, perspective, emphasis, color, etcetera. Both Michelangelo and Norman Rockwell also considered these things when they created their work. I suggest you look around at all the art that surrounds you, from product designs, to magazine illustrations, to museum shows, and ask yourself, is this art? And is it good art? Just because it’s fine art doesn’t make it better art than illustrations. I have seen strong illustrations and weak fine art—the defining difference being only their usage. If Rockwell’s Freedom from Want decorated the Sistine Chapel, this would be a wholly different conversation. The important thing is to observe the art around you and remember that it wasn’t created in a vacuum. Whether or not it’s illustration or fine art, a great deal of thought and care went into creating the images we see. I believe that at the end of the day a great idea, strong design, and superior execution create good art. I think both Michelangelo and Norman Rockwell would agree with that. Rachael McCampbell is an artist, teacher, curator, and writer who resides in the small hamlet of Leiper’s Fork, Tennessee. For more about her, please visit www.rachaelmccampbell.com.